I love the kitchen’s ability to transport me to another place. Cooking traditional recipes from around the world satisfies my inner Wanderluster while giving me a sense of exploration in an everyday task. Lately I am loving Latin cuisine and have been inspired to healthify recipes traditionally made with lard, refined sugar, dairy milk, and/or large amounts of salt. 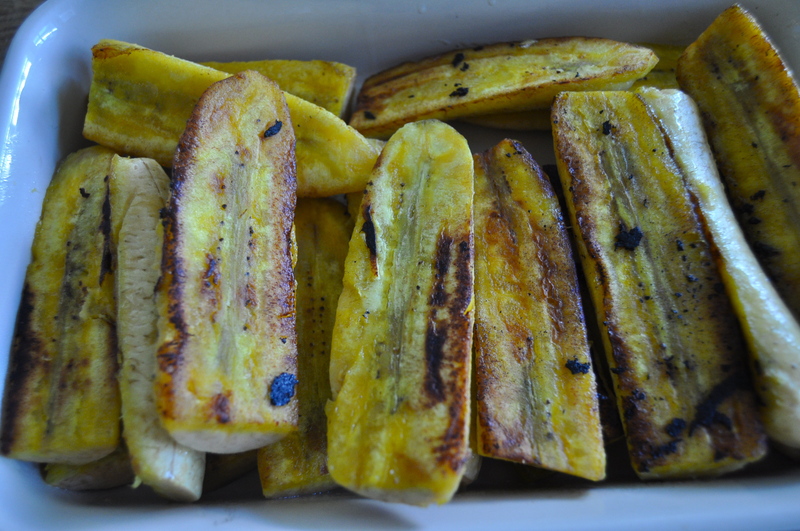 The same place I purchase my bananas from, recently had a case of plantains and…yep….I brought a box home 😉 You can commonly find plantains in Asian or Latin grocery stores (they look like big bananas and taste like heaven). These two recipes go perfectly well together and make for a warm comforting breakfast, or a lovely snack to eat in the evening, outside, while reading your favorite book. If you haven’t heard of atole (a creamy, sweet, corn based drink), you are in for a treat. It is common to purchase packages of this drink (just add water), but those are made with GMO cornstarch, refined sugars, and other chemicals. This all natural version using fresh corn will be good for your soul and your body. Make this now, while corn is in season, and make sure to purchase some corn to keep in the freezer as this will make a perfect drink to transition through fall and winter. Heat a cast iron (my preference) or other skillet over medium high heat. Add the coconut oil. Add the plantains in a single layer. Cook until the underside is browning in spots. Flip. Continue cooking until both sides are nicely browned and caramelized (see picture). Remove from heat and place on serving plate. Sprinkle with cinnamon and coconut sugar. 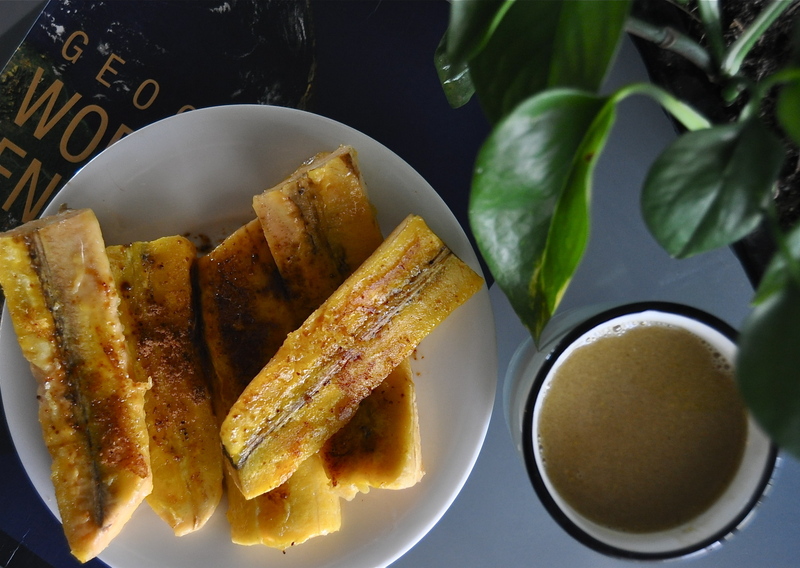 This entry was posted in dessert, snack, vegan, vegetarian and tagged atole, dairy free, drink, easy, gluten free, healthy, latin american, mexican, recipe, salvadoran, vegan. Bookmark the permalink.